Get inspired by our ultimate guide to the best places for playing golf in Mallorca. We found the top golf courses in this beautiful destination of Balearic Islands. Our tips for hotels nearby will help you to choose the best match for your unique golf experience with great accommodation! We have researched from various resources top 12 best rated golf courses in Mallorca. At the bottom of the article all golf courses are geotagged in a map to give you quick overview. And we have listed the best hotels in Mallorca as well for a perfect golf break. Opened in 1964 this was the first golf course on Mallorca, and is located in the luxury residential area of Son Vida, just inland of Palma. Meandering through the villas and residences it challenges with narrow fairways and its hilly landscaping. Outstanding is the view from the 6 th hole to the Cathedral of Palma. This beautiful second course of Arabella Golf is also located in Son Vida and was inaugurated in 2000. It is much wider though quite challenging for all levels of golfers. Its hole 15, a par 5, is a 517m long uphill hole, probably the toughest on the course. This course west of Palma is a pure joy for the good golfer, thanks to its magnificent sea views and situation against the backdrop of Bendinat Castle. It has wide and open fairways and is relatively short in distance, though several dog-legs present a challenge. The finishing hole with 454m to the pin calls for a long drive. Our Hotel Suggestion: Sant Francesc - a sophisticated luxury hotel in Palma´s historic city centre perfect for golf and cultural escapes. With majestic mountain views of the Tramuntana, this course is fun to play for all handicaps. Several lakes influence play and bunkers are well-placed obstacles making it tough but fair. The par-3 hole number 12 stands out with its 210 yard length. Our Hotel Suggestion: Gran Hotel Son Net - a picture perfect 5 star countryside hotel ideal to enjoy the Tramuntana mountains in style. *Note: At the moment, 18 holes are closed and only 9 holes golf course is open. Golf Santa Ponsa consists of a total of three courses, although only Santa Ponsa I is a public course. Beautifully set and fairly flat it is the perfect leisure course, although there‘s a challenge for long hitters: it boasts probably the longest hole on the island , number 10, at 590 yards long. This course opened in 2000 and is definitely one of the top courses on Mallorca. Not only is it one of the most difficult ones, it also boasts breathtaking views. Relatively hilly, it requires great accuracy; raised tees and plenty of lakes contribute to the challenge. 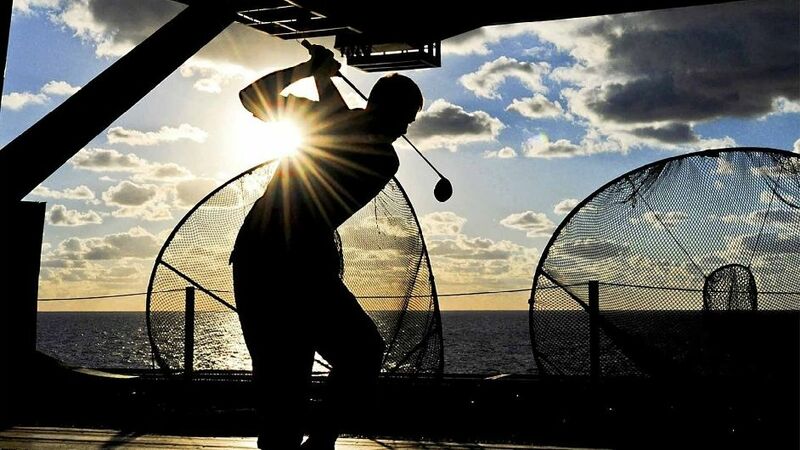 Tip: it gets busy, so reserve your tee-time well ahead of time! Our Hotel Suggestion: Castell Son Claret - a 5 star hotel with delicious Michelin starred cuisine. A fairly short course and not too difficult it is designed to be a pleasure to play for the visitor. Undulating fairways meander over what was originally a hunting estate, and the course is rich in fauna and flora. The scenic Tramuntana adds to the charm of the area. Our Hotel Suggestion: Jumeirah Port Soller Hotel & Spa or Boutique Hotel & Restaurant Ca‘s Xorc - romantic luxury hotels with unique settings. Both courses belong to the nearby Marriott Son Antem, and will remind you of an American-type course as they are fairly open and mostly with water hazards. While Son Antem East is characterized by wide fairways and flat greens, easy to play for beginners and intermediates, Son Antem West is more demanding with undulating greens and much narrower fairways. Our Hotel Suggestion: Fontsanta Hotel Thermal Spa & Wellness - fantastic seaside adult´s only hotel near the natural reserve of Es Trenc. This 9-hole course is a good alternative when staying at the luxury boutique hotel Son Brull, in the northern part of the island. Joyful to play, with magnificent views of the Tramuntana mountain range and the Bay of Pollensa. You can enjoy 18-hole course too. Named after a little island just off the coast, this course offers a great variety of holes, making it interesting for all skill levels. Challenging greens with hidden breaks along with a generally hilly setting require accuracy in woods and irons. It is beautiful to play, running consistently by the sea and framed by pines & olives. Our Hotel Suggestion: Hotel Can Mostatxins - boutique hotel that offers a harmonious balance between stylish accommodation and old world charm and ambience in the heart of Alcúdia. Designed to follow the original landscape pine and olive trees are a common sight around the course. Lakes come into play on four of the holes, and although fairways are wide, accuracy is required throughout the round. Our Hotel Suggestion: Hotel Convent de la Missió - a luxury designer hotel in the heart of Palma´s Old Town. Situated on gently rolling landscape, this course is only a short distance north of Palma and is reminiscent of a true links course. Olive trees and the estate’s own vineyard frame the course that is attractive to all level of players. Water hazards along with a good number of bunkers, as well as large greens with subtle breaks are its main characteristics. Our Hotel Suggestion: Hotel Cap Rocat - stunning luxury seaside hotel with private beach overlooking the bay of Palma.